An annual club event for 250 guests. The event was held in a 40ft x 120ft Marquee which was connected to the club house via a 10ft x 10ft walkway. The decor of the Marquee consisted of Ivory pleated linings with a black & White swag. 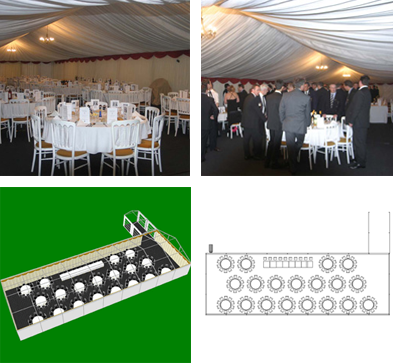 The Marquee was carpeted with charcoal marquee carpet, and had a Black & White Dance floor. Guests were seated at 5ft Round tables with white banquet chairs with black pads.